Small Peculiar – It's comedy yttrium! Updated every Thursday. The story in the middle panel comes to us from Rabbi Bibi bar Abaye, who lived in the second century and got frequent visits from the Angel of Death. His assistant, sent for “Miriam the hairdresser” brought him “Miriam the children’s nurse” instead. 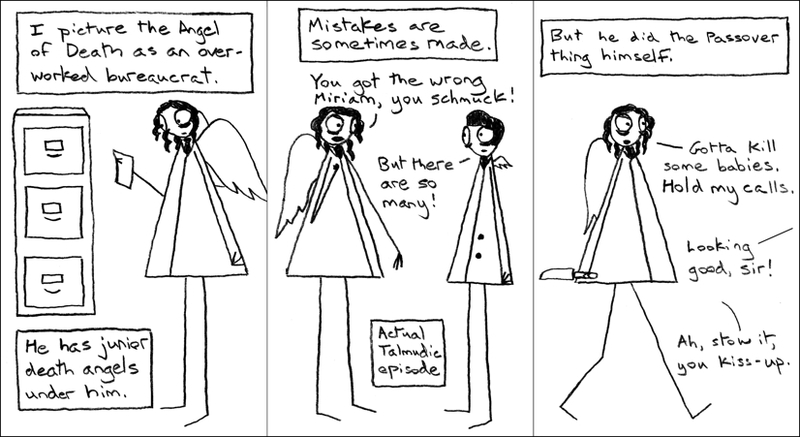 When informed that this was not the correct Miriam, the assistant angel offered to put her back, but the Angel of Death said no, you can’t put them back, we’re stuck with it now. The version of this story that I read didn’t mention whether Miriam was in the room with the angels while they were discussing this, or what she thought of the situation. I’m told, furthermore, that situations like this are why Jews traditionally do not name children after relatives who are still alive—that would create the possibility that the child would die in place of the older relative because of some mixup like this. Kind of makes you wonder how often it happens. What kind of ship is Azrael running?